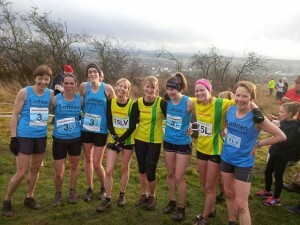 Club ladies are East League runners up. The 2013-14 East District Cross Country League concluded at Broxburn at the weekend and it saw the Lothian Running Club ladies team finish in an excellent second place overall. The three team scorers on Saturday were 16th Jo Hall, 32nd Lana Turnbull and 51st Christine MacVarish and their total of 99pts on the day were enough to place them runners up in the overall classification with 180pts, a single point ahead of 3rd placed Falkirk V. H. Fife AC were the clear winners on 79pts. Points were accumulated over the three venues at Livingston, Alloa and Broxburn. There was an excellent turn-out of LRC members at the event with a total of 28 over the various age category’s. The Senior mens race saw 16 runners in action and they were led home by club captain Max McNeil in a marvelous 6th place , McNeil been in a fine vein of form in cross country events during January representing both Scotland and the East District. Lothian’s mens team finished the East League series in 9th place overall. A big thank you to our Team Managers (Martin and Margaret), and everyone else who lent a hand. 6th Max McNeil[30m.13s], 44th Malcolm Lang[34m.13s], 70th Euan McInnes[35m.59s], 82nd Colin Partridge[36m 35s],90th Owen Williams[36m 47s], 102nd Graeme Ackland[37m 15s], 108th Donald Shaw[37m 28s], 130th Kenton Jones[38m 35s],133rd Andy Fish [38m 41s], 147th Harry Mulholland[39m 29s], 163rd Alan Moffat[40m 00s], 170th Colin Eades [40m 25s], 183rd Finlay Slane[41m 15s], 219th Ken Mearns [44m 35s], 224th Jim Alexander [45m 17s], 248th Jonathan Barclay [50m 06s] 255 Completed. Team 9th overall out of 15 teams. 16th Jo Hall [24m 48s, 32nd Lana Turnbull[26m 01s], 51st Christine MacVarish[27m 08s],55th Lynne Murray[27m 17s], 89th Jill Horsburgh [31m 07s]. 105 Completed. Team 2nd overall.